Birkenstocks are the ultimate ladies sandals. However ugly they are I just love something about them. I look at them and they just scream comfort! I love how they’re indented so your feet fit inside them perfectly. They’d go perfectly with jeans or shorts over the summer, I wasn’t a huge fan of sandals but I think I’d love a pair of these simply for the comfort factor! I’m a huge fan of the Nike SB’s. I know I don’t skate but they’re really nice trainers and I love how low the sides are, especially for the summer. They also come in easy to wear colours, which is great since I’m not a massive fan of those bright neon trainers that come from some other brands. I am obsessed with Disney Princesses and everything with them on. In all honesty I’d love a pair of the low Disney Princess vans but they’re only in junior sizes. These are the second best thing and they would be so lovely to wear, especially with the pretty Disney Princess colours which will be great for summer. 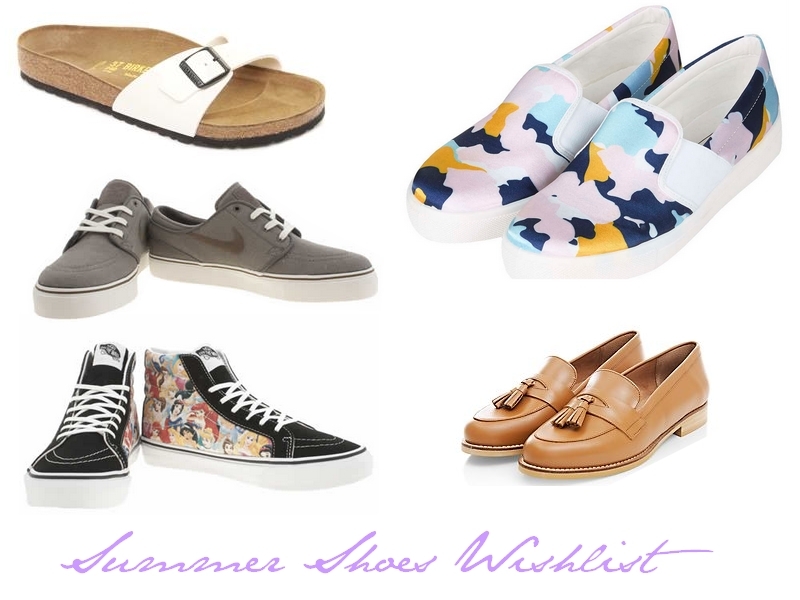 I love skater shoes, especially for summer. I have two pairs from Topshop from last summer and they’re still going strong so I know they’re good quality! The print on these is fun and summery. They’d be lovely to wear with shorts, jeans and anything that went with the colours in them. I’ve wanted a pair of tan loafers for so long but I couldn’t find the perfect ones. I think I have finally found the perfect ones! These will go perfectly with dresses, playsuits, shorts, basically everything that the tan colour goes with.